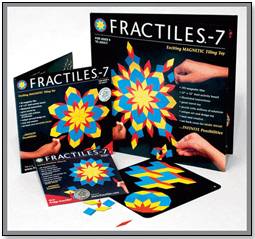 Travel Size Fractiles-7 – a magnetic tiling toy from Fractiles Inc. – is a sneaky way to keep kids learning about math, science, engineering and technology (STEM) even as they ride in the car to grandma's or hang out on the beach. Invented by Beverly Johnson, Travel Size Fractiles is an award-winning, open-ended travel version of her Fractiles game that combines the idea of fractals – mathematical sets that display self-similar patterns – with brightly colored, diamond-shaped magnetic tiles that can be combined infinitely to create snowflakes, starbursts, flowers, butterflies, spaceships and more. Designs are limited only by the child's skills and imagination – both of which grow with time – and can be as simple or as complex as desired. The travel game comprises 96 brilliant colored, flexible magnetic tiles, a sturdy 8 x 8 black textured magnetic board for play and display, illustrated instructions, and a double record-album style package to facilitate storage. Fractiles Inc. was founded by Beverly and another geometry fan, Marc Pelletier of Zometool, to "help bring the beauty of geometry into the mainstream." Pattern recognition is an essential human skill that allows humans to do everything from realizing that a wolf has appeared on the horizon to solving complex engineering problems. "Lack of pattern recognition skills is linked to learning disabilities," Beverly pointed out, "And Fractiles has been show to help kids build pattern-recognition skills." Steering kids toward play that builds STEM skills has been a growing trend, but many of the toys that claim to promote these skills actually do not. "Traditionally, the four parts of STEM (science, technology engineering and mathematics) have been taught separately and mostly independently from each other," Beverly explains on her website, www.fractiles.com. "In STEM Education, these subjects all play an integral part in the teaching of the whole. STEM Education provides a creative, hands on approach to problem solving by applying what has been learned. Students learn by doing." Mark Carson – inventor, retailer and president and co-founder of Fat Brain Toys – is skeptical of the many playthings that claim to develop STEM skills. "When you play with a real STEM toy, you may not be learning any specific skill, rather you're learning the fundamentals of critical thinking, problem solving, visualization, and perseverance." 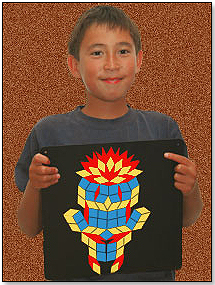 One of Mark's favorite "real" STEM toys listed on his website is Fractiles, which he honored with the #1 spot. Prof. John Hall, winner of a 2005 Nobel Prize for Physics, and his wife Lindsay, a retired English teacher and educational materials specialist, used Fractiles to help children in public schools learn STEM skills and become active agents in their own education. "Fractiles is ideally suited to this kind of program and extremely popular with our students as it encourages creativity and innovation," said Prof. Hall. "We wish there were other materials of a similarly versatile and compelling nature." One feature that makes Fractiles ideally suited to traveling families is that it can be enjoyed by family members of almost every age, from 6 to adult. "Fractiles is so popular with my first graders, that we have to have a sign up for equal turns!" exclaimed teacher Marilyn Bowker. "My 7th and 8th graders live for free time so they can play with Fractiles," said Sandra Bullard of The Prentice School, "Where Children with Dyslexia Learn to Learn"
"My husband is having as much fun using it as my 6 year old," noted Karen Shelton, who rated it 4 out of 5 stars. Fractiles' youngest fan, Jamie, was only 3-1/2 when he showed off his first design. Children of that age, however, must be supervised owing to the small size of the pieces, warned Beverly. Travel Fractiles' smaller sized board and magnetic surface make it ideal for long car, bus, plane or train trips, where swerving and bumping might otherwise disrupt the play. "I purchased two of these, one each for my daughters – 5 and 7," said Mary Schneider, who rated it 5 out of 5 stars on Amazon.com. "They don't even realize they are learning as they create. Hours passed by on the plane as they put together countless designs to be shown to others...I would recommend this product for children 5 and over especially while traveling because it truly engages children." Diane B. Crichlow, Museum Store Chair at the Reynolds House Museum of American Art in Winston-Salem, NC, selected merchandise by researching museum stores for a year and testing products on her 12-year-old granddaughters and 9-year-old grandson. She said, "[Fractiles] are the best thing yet! The whole family has enjoyed them and they are super for travel!" As a plus for those who would like to support products that rely on local labor, Fractiles is completely manufactured in the USA without any child labor or exploitation. Travel Fractiles by FRACTILES, Inc.
Other products from FRACTILES, Inc.
Fractiles - a Real STEM toy! These 96 brilliantly colored, flexible magnetic tiles come with a sturdy 8" by 8" black textured steel activity board, color-illustrated instructional material, and a double-record album-style package to store the board and tiles. The diamond-shaped tiles are used to create everything from snowflakes and starbursts to a bouquet of flowers and swarm of fireflies. Made in the USA. — Patti Tepper-Rasmussen, owner of Learning Tree Toys, Games & Books, Inc. in Oklahoma City, Okla., told TDmonthly in an April 2013 survey that Fractiles are one of the store's best-selling travel products. "It is a perfect 'STEM' toy that teaches math while kids play...Fractiles was way ahead of its time, and now is perfectly positioned to become a hot seller." - Sallie Kashiwa, owner/president of Timbuck Toys in Co.
"A great selling toy, [Fractiles] have become one of our personal favorites. They are educational, reasonably priced, and made in America by a reputable company." - Kristine Reed from Whispering Winds in Mr. Dora, Fla. This award-winning magnetic tiling toy allows one to make an infinite variety of beautiful designs. It can be used to create starbursts, spirals, butterflies, beautiful mandalas of infinite complexity, bouquets of flowers, swarms of fireflies, spaceships, illusions of 3D space, and lots more. It is easy and creative. This product is made in the USA. "It is a perfect 'STEM' toy that teaches math while kids play...it has a strong art component, too! Fractiles was way ahead of its time, and now is perfectly positioned to become a hot seller for all the families who are looking to enhance education through play!" - Sallie Kashiwa, owner/president of Timbuck Toys in Co.
"On top of being a great selling toy, [Fractiles] have become one of our personal favorites. They are educational, reasonably priced, and made in America by a reputable company. It's very rare for a toy line to meet all of those qualifications. " - Kristine Reed from Whispering Winds in Mr. Dora, Fla.
FRIDGE FRACTILES by FRACTILES, Inc. This set includes 48 brilliantly colored flexible MAGNETIC tiles and a color-Illustrated cardboard CD-style package to store the tiles. Board not included. Fridge Fractiles make great stocking stuffers and can be used on a fridge or filing cabinet. They are made in the USA. "We have carried Fractiles for several years and, on top of being a great selling toy, they have become one of our personal favorites. They are educational, reasonably priced, and made in America by a reputable company. It's very rare for a toy line to meet all of those qualifications. " - Kristine Reed from Whispering Winds in Mr. Dora, Fla.
LARGE FRACTILES by FRACTILES, Inc. 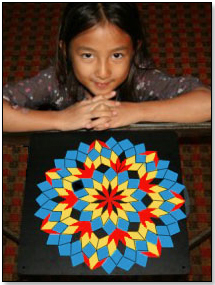 This award-winning magnetic tiling toy allows one to make an infinite variety of beautiful designs. It can be used to create starbursts, spirals, butterflies, beautiful mandalas of infinite complexity, bouquets of flowers, swarms of fireflies, spaceships, illusions of 3D space, and lots more. The set includes 192 brilliantly colored flexible MAGNETIC tiles, a sturdy, 12” x 12” black textured steel activity board, color-illustrated instructional material, and a double-record album-style package to store the board and tiles. It is great for the ambitious budding designer or for classroom use. This product is made in the USA. "On top of being a great selling toy, [Fractiles] have become one of our personal favorites. They are educational, reasonably priced, and made in America by a reputable company." - Kristine Reed from Whispering Winds in Mr. Dora, Fla.
•TDmonthly 2014 Top Toy Debut Award WINNERS - Just Fun: 45 Retailers Have Made Their Picks! •Are Your Employees Putting Your Retail Brand At Risk?